My grandfather likes to sprinkle “hibi” (or dried baby shrimp) on fried rice and law-uy..is “hibi” also known as ba-la-o in Bicol? That looks like “uyap”, a type of shrimp paste we get from Iligan. I think it is actually krill, rather than baby shrimp, because they don’t grow any bigger. But I am not a taxonomist. In Iloilo, we use this in pasty form for ginisa na monggo (among others), where it imparts a very mouth-watering seafood taste. I remember balao being used in almost all Bicolano vegetable dishes with coconut milk. The bigger variety is used for Bicol Express.Deedee, hibi is also called the same in Bicol. Mabalos, MM for this post. when fresh balao is abundant in the bicol markets, you know it’s butanding season..
Is this the same as the balao-balao, after which is named that restaurant in Angono? Cumin, no, I don’t think it is the same, I think the balao-balao is fermented rice and shrimp… if I am not mistaken… and possibly even pronounced balaw-balaw, perhaps? The pungent the fermented shrimp is the tastier it is. Love the natural color of the balao the lighter ones rather than the pinkish ones. Could be the secret ingredient of the Bicol region for a good laing and other coconut stewed foods? I read somewhere that the anchovies and small shrimps that are processed to become bagoong in Pangasinan come from Bicol region. I still prefer the fresh or processed small shrimps from the provinces than those from Malabon or commercial shrimp paste. 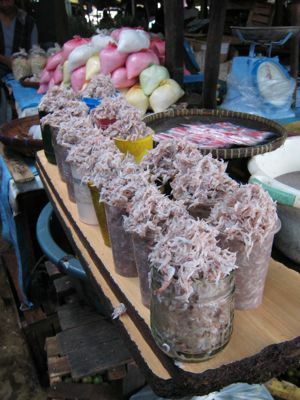 Fresh krill for torta or halabos with calamansi & patis, or good shrimp paste for green mango & kare-kare, hehe. Now I know why whale-sharks/butanding frequent the sea near bicol/sorsogon area, it’s teeming with krills. I know this, and that block of fermented shrimp you wrote about.. 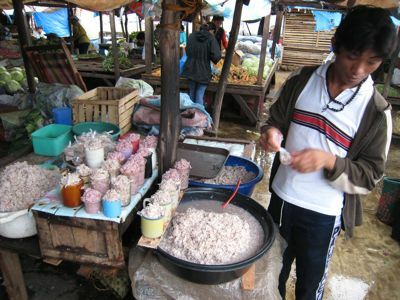 I saw that in the Daet Market when I went there about 8 years ago.. The baby shrimps are good with that Bicolano Santol dish.. In Mauban Quezon, when we cooked balao, we add SANTOL meat. I forgot how the process was. Pero wow and sarap. Place in a sieve or colander and wash it under running water. Drain very well and season or mix with salt,a little brown sugar, minced or pounded garlic and fry in hot oil until crisp. Watch closely as it burns easily. Drain and store. This is good to mix with rice or sinangag. It keeps indefinitely, if stored in the fridge. Cumin, MM is exactly right. Balao-balao (stress on the first syllable) is burong hipon. It looks like a thick congee. 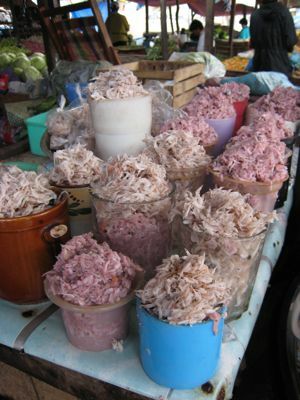 As for the krill, my mom likes it torta, or sauteed with onions, garlic, salt and chopped kamias. With steaming white rice, of course. hi! I also have tried that balao with santol in Mauban,Quezon but I cannot remember if it had coconut milk. It was unforgetable, really went well with fried fish. Could I get a recipe please???? i can hand you down the recipe if u want….